You MUST install Microsoft .NET 4.7.1 to enable TLS 1.2, which is required for the Shift4 interface. Shift4 will end support for older versions on June 30, 2018. You MUST get an Access Token from Shift4. Please contact Shift4 for help with this. We cannot begin this process without it. Each of these steps must be completed at ALL TERMINALS that will process credit cards. Failure to do so could leave some terminals unable to process credit cards. A static public IP address is required for i4Go V2. Contact your internet provider for assistance. Contact your IT Professional and internet provider to be sure the IP addresses provided to us are correct. Giving us the wrong IP addresses can delay the process by several days or even longer if we have to reschedule. Please provide Shift4 with the public IP address or address range that the clients and servers will use. If you don't have a Shift4 contact person, give us the information and we will relay this information to Shift4. They will "white list" these IP addresses. This link will show you the public IP address of the computer you're currently using. If the software runs in a Remote Desktop Services session, you must verify the IP address from within the Remote Desktop Session. Keep in mind you may have more than one public IP address! Use this link at all computers needing to process credit cards. If you use a proxy server, be sure that the user can access it without authentication or by using the logged in Windows user credentials. Our interface will only be able to use the Windows user credentials. Make the necessary firewall changes so that the server and clients can communicate with Shift4. The server and clients should have Internet Explorer 10 or 11 . If you don't have Internet Explorer 11, you need to verify that TLS 1.2 in Internet Explorer 10 Internet Settings is enabled. Failure to do this may prevent you from processing credit cards. After Shift4 confirms that your IP address has been white listed, verify that you can access this URL in Internet Explorer with no certificate errors. Make sure that you aren't using a DNS filtering system. These are sometimes used to prevent access to certain websites and may be blocking access to Shift4. If DNS isn't your issue, and you've done everything in steps 1, 2 and 3, contact Shift4 to see if they can assist in resolving this issue. Execu/Tech has no control over your browser, network, firewall, internet or access to Shift4. Contact Shift4 at 702-597-2480. However, if you see a response like this, please return to step 1 and begin again. If you get a certificate error, install this certificate at the computer getting the certificate error. Clicking "Continue" DOES NOT address the issue and the interface will not work until you follow the instructions. This is not an Execu/Tech requirement, it's a Shift4 requirement. Please contact Shift4 with any concerns. If the certificate error isn't addressed, Execu/Tech software on all affected computers will return the following error when attempting to process a credit card. "System.Net.WebException: The underlying connection was closed: Could not establish trust relationship for the SSL/TLS secure channel. ---> System.Security.Authentication.AuthenticationException: The remote certificate is invalid according to the validation procedure." We can't fix this, this is the operating system returning the error. Install the latest version of ETRegister and run Register Programs and Controls at the server and each workstation for every Windows user that will use the software. In a Remote Desktop environment, this must be run for each remote user. If you just received a software update, you may already have the latest version. 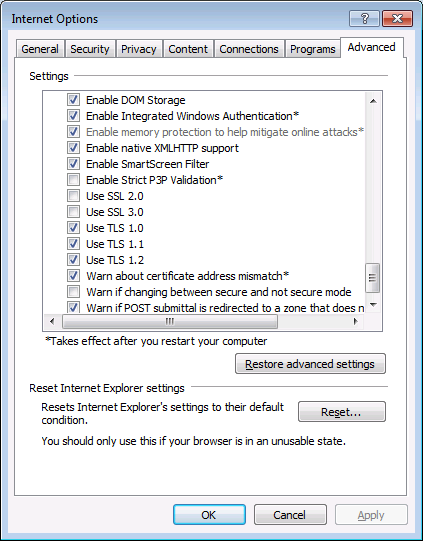 After installation, you may see Internet Explorer Enhanced Security Configuration errors. Follow this guid to remove them. Unencrypted Credit Card Readers should be configured to send a single Carriage Return after the last track and not a Carriage Return after each track. If you have a brand other than MagTek, contact the manufacturer. Credit Card Masking MUST be enabled!